Dr Harold Schenberg was a respected Western Australian dermatologist, renowned art collector and philanthropist. In his own words, Dr Schenberg had an “absolute zest” for living, and viewed everyday as a cause for celebration. He was a colourful man, due not only to his vibrant personality, but also his bright and somewhat daring wardrobe. He once explained that he believed colour represented happiness – and there was a lot of it in his life. Dr Schenberg filled his Matilda Bay home with things that made him happy, such as art and music, and he took great joy in sharing these with others. An accomplished jazz pianist, Dr Schenberg entertained many over the years with renditions of his favourite Cole Porter and Gershwin tunes. 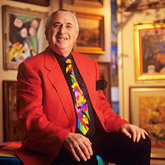 While his extensive art collection was a great source of personal joy for him, he also delighted in giving pieces away. The Art Gallery of Western Australia and The University of Western Australia (UWA) are both significant beneficiaries of Dr Schenberg’s generosity. Dr Schenberg’s relationship with UWA started in 1948, when he was a first-year medical student. Although he completed his studies interstate (as a full degree in Medicine wasn’t offered at that time), his affiliation with UWA continued throughout his lifetime. In 1969 he enrolled in Music, but had to withdraw owing to the workload at his busy practice. In 2000, he was awarded an Honorary Doctor of Letters from UWA, in recognition of his “distinguished services and contribution to the Arts”. Dr Schenberg died that same year, but even now, more than a decade later, he continues to enrich the Arts at UWA through his contribution.